Survive and Project Indirect Fires - The Americans .US! AMRDEC pursues two missile technology solutions to strengthen the Army’s hand in close combat. One of the top U.S. Army modernization priorities is increased precision and effects at extended range in all operational environments. This is part of a broader strategy to make war-fighting units more lethal to regain overmatch against peer and emerging threats. In response, the deputy assistant secretary of the Army for research and technology’s lethality portfolio is investing in a layered, extended-range precision fires solution across operational levels to shape deep and close fights. The lethality portfolio represents science and technology (S&T) investments at the U.S. Army Aviation and Missile Research, Development and Engineering Center (AMRDEC) and other contributing elements of the Army S&T enterprise. The close fight, or close combat, is the final engagement phase, wherein U.S. ground forces maneuver to seize and control key terrain and destroy enemy forces. This fundamental building block of operational success may be challenged by highly capable peer threats, particularly in anti-access and area denial threat environments where U.S. forces may lack traditional close air support, and where U.S. anti-tank guided missiles may be outnumbered. To address this gap, two midterm S&T investments in close combat missiles are focused on giving small expeditionary units increased stand-alone precision and lethal effects at extended ranges to enable freedom of maneuver to decisively defeat the enemy. MSET works by relaying sensor target inputs to a vehicle-mounted command-and-control and fire-control system. That system determines grid coordinates, generates flight paths and launches the appropriate number of missiles. Those missiles are guided via real-time waypoint updates to the target location, and image processors on the missile provide positive identification, target lock-on and track to terminal. The Single Multi-Mission Attack Missile (SMAM) is an emerging precision loitering missile capable of engaging enemy tanks and other high-value targets out to 35 kilometers or farther. Loitering refers to a missile’s ability, when commanded by the operator, to fly a specified flight path to a known target location, circle in a holding pattern once in the target area, and engage or wave off and then re-engage the same or a different target of interest. SMAM includes a self-contained launch tube and a portable mast-mounted antenna. With a total weight, including the missile, of 50 to 70 pounds, the system is easily transportable and can be readily mounted on a range of Army ground vehicle or aviation platforms. AMRDEC and partnering organizations have been developing this emerging capability for several years. The organizations achieved a major milestone in June 2015 with a successful proof-of-principle, live-fire range demonstration that resulted in direct hits on a 12-man mannequin array and a sport utility vehicle, both located 25 kilometers from the launch point. The AMRDEC Enhanced SMAM S&T program, getting underway in FY18, will focus on precision navigation and targeting at extended ranges in contested, GPS-denied and electronic-jamming environments, as well as optimizing warhead technology to defeat main battle tanks. AMRDEC is also working on another system: Missile Multiple Simultaneous Engagement Technologies (MSET) is a suite of technologies providing the capability to rapidly defeat swarming and dispersed threats, providing simultaneous multiple launch, control and supervised autonomous terminal engagement of multiple missiles against various targets. MSET is configured as a kit that could be hosted on a variety of manned and future unmanned Army ground vehicles and aviation platforms. (See Figure 2. )This allows it to leverage existing organic intelligence, surveillance and reconnaissance targeting sensors such as small unmanned aircraft systems, day and night cameras and forward-deployed radars. 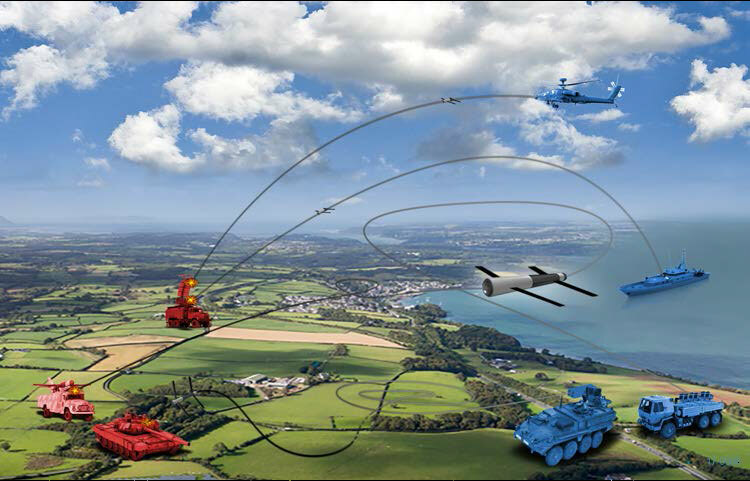 Both SMAM and MSET are designed to directly accept precise target location coordinates transmitted over the tactical network from external targeting sensors. AMRDEC initiated a rapid prototyping effort for MSET in 2016 that involved modifying and integrating existing technologies to demonstrate concept feasibility. The goal was for a single operator to be able to fire and control six loitering precision missiles against four static targets and two moving targets, using an Android application to simultaneously control the surrogate missiles and then sequentially perform the terminal engagements. Targeting data was provided by a surrogate radar feed. AMRDEC successfully conducted extensive hardware-in-the-loop integration and testing, coupled with six risk-reduction flight test events over a nine-month period. This culminated in a proof-of-principle range flight demonstration conducted by AMRDEC in November at Dugway Proving Ground, Utah. Future AMRDEC S&T efforts on MSET will focus on developing image-processing algorithms to enable supervised autonomous terminal engagement, i.e., moving from “man-in-the-loop” to “man-on-the-loop,” where the operator can still observe an engagement while retaining the ability to abort the mission once the target has been positively identified by the operator. AMRDEC’s future efforts also will focus on developing key operator fire control and data link technologies that will scale the system up from six simultaneous engagements to as many as 20. 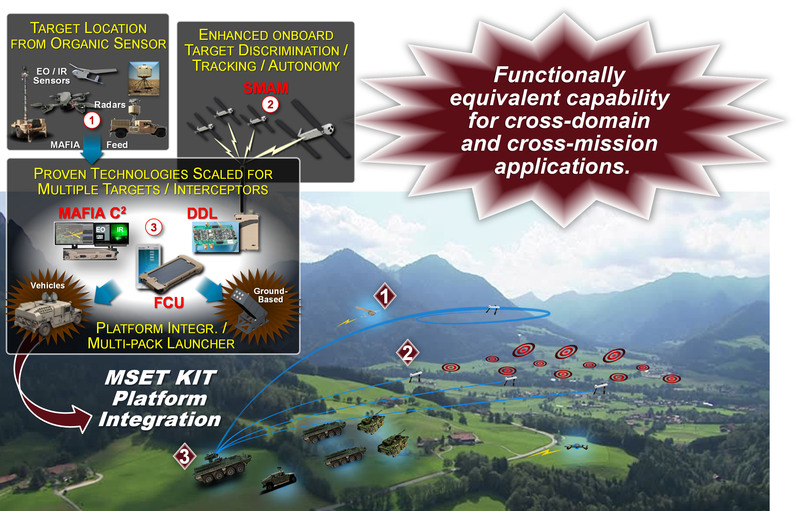 S&T programs for SMAM and MSET will demonstrate key technologies to enable U.S. Army multidomain battle and the manned-unmanned teaming operating concepts of decentralized, expeditionary maneuver in contested environments. Once fielded, those technologies will provide brigade combat teams with precision strike capability at extended ranges against hard armor and high-value targets in scenarios that demand increased autonomy while providing increased Soldier survivability. These close combat investments are part of the lethality portfolio’s integrated strategy to achieve the Army’s precision fires modernization priorities. For more information on MSET, refer to Sources Sought W31P4Q-17-R-0132, released June 22, 2017. SPENCER HUDSON is a senior project engineer with AMRDEC and serves as the Ground Tactical Capability Area lead, managing and directing multiple ground S&T efforts established to address and support technology needs and gaps for both the Close Combat Weapon Systems Project Office and the U.S. Army Maneuver Center of Excellence. He holds an M.S. in aerospace system engineering and a B.S. in mechanical engineering, both from the University of Alabama in Huntsville. He is Level III certified in engineering and is a member of the Army Acquisition Corps (AAC). SHANNON HAATAJA is a project engineer with AMRDEC, serving as the Ground Tactical Capability Area deputy lead and the MSET project manager. He holds an M.S. in aerospace system engineering and a B.S. in electronics engineering, both from the University of Alabama in Huntsville. He is Level III certified in engineering and is a member of the AAC. The Changing Face of Soldier Lethality! PEO CS&CSS Throws Experimentation All Into The Mix II. Speed Acquisition I. Per Vivo Labs Warms II. Tech Transfer I.